The oversized arched window caught our attention while the modern kitchen (with two Sub-Zeros) kept us looking. 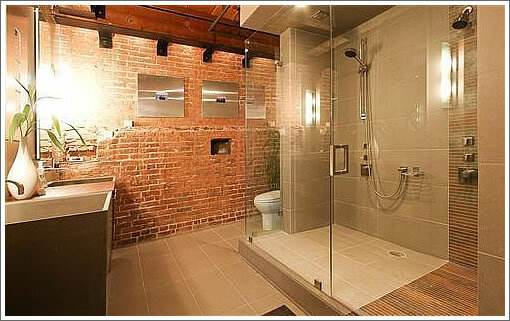 The four headed and two-toned (not to mention two-person) shower got a nod. And one other Oriental Warehouse two we couldn’t help note: parking spaces. This unit is the largest unit in the building at approx 1800 sq feet. There’s not much of a view out the huge carriage window (unless you like the Brannan gym — which can be fun), but still a striking space. The mezzanine is large and runs the full length of the unit with a walk-in closet, laundry room/study, and bedroom. I used to own this unit and it is really great to see what the subsequent owners did with it. Great job! Cheers. And as always, thank you for plugging in. There was a unit for rent in this building last weekend for $3k and I know someone in there who rents for less. as many people know, I’m not huge on lofts… but this space is very striking. very cool IMO. this is a real loft, unlike all the other cheapie spaces that are made into lofts mainly to save on wall construction costs! (joke). TOO DAMN COOL. I LOVE IT. NO APOLOGIES FOR THE ALL CAPS. THIS LOFT DESERVES IT. I’ll go way out on a limb and suggest that this would not rent for $3K/month. Call me crazy. And before it comes up: No, it’d be a terrible spot for the Gymboree/Bugaboo set. But remember, some of us don’t like children. While I don’t like lofts in general, this one is pretty nice. Why can’t some of these million dollar condos have finishes like this one, ie.kitchen and bath. Infinity has some nicer kitchens on the top floors of tower two, but at the prices they charge, they all should be of the quality seen here. We actually have some nice friends (with kids) who live in this building. It is a wonderful space, though a bit small..
as far as the rent @ 3k — that would seem to be relatively on the mark for that size and fit out..
the ask on the buy does seem a bit steep, however. I agree — outstanding job and great building. But, I’m a little stuck on the price. HOA and property tax will run more than $2K/month. Add in another $9k+ in mortgage and that is a might big number for an 1885 sq ft loft. What is the most this could possibly rent for? $6K? $7K? Now, drop the price $400K and I’d gladly incur the monthly equity burn . btw, JohnK’s comment above mine is one of the best things about socketsite — the readers are very plugged in! 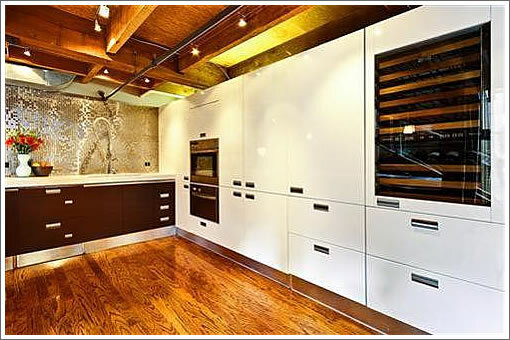 how much would you folks guess those kitchen/bath upgrades cost the guy who paid $950K back in ’04? Interesting that there is a 1997 price listed. I just finished reading the book Contagion: The Financial Epidemic That Is Sweeping The Global Economy by John Talbott (a former investment banker). He estimates home prices to return to 1997 levels + inflation. 1997 was the year that the mortgage industry greatly eased lending requirements, and all the nontraditional loans became the norm. Granted all ares of the US are different, but its an interesting hypothesis. sunnyvalesteve, I can’t imagine it could have been more than $130K, but I’m sure somewhere here has a more informed estimate. Well, I guess we’ll find out if the market is willing to pay 80% more than the 2004 price for renovations that don’t involve an increase in square footage. And, Ed, 200K? Is the theory that they had to rip up a bunch of concrete and wrote a blank check to Limn? As I said, there are many more familiar with costs than me, and I would group a socketsite editor in that category. The editor said 200K for the kitchen alone, and that’s an extremely high estimate, IMO. Two hundred for the whole shebang seems about right. Let’s all remember that what you pay to renovate/modify a property does not automatically raise its value by that amount. Like any market, it only adds value if you can find some punter willing to pay for it (most will not). I wonder why they spent all that money and didn’t replace the wood floors. The floors are, of course, in great shape, and maybe that’s the reason they weren’t replaced, but they don’t seem to match the modern, high end aesthetic. And the editor didn’t say the kitchen alone was 200K, he said eyeballing the kitchen alone (and realizing that there were bathrooms as well), that the entire budget was unlikely to be under 200K. Tempting. I am a sucker for nice details. This is one of the few places that has been featured on SocketSite that really looks great. Most remodels are trash, this one is very tasteful and the base space, at 1800sqft, is a good foundation. I stand corrected re: “kitchen alone,” but he also intimated that it might even be over three! If you look at what can be had in the town right now for $1.6M, this place is way overpriced and will likely drop another 400k before closing. Side note: a friend of a friend retold the tale of purchasing at the Radiance. Said that he held out for his price and got it. For those with the means, this is a once every 20 years opportunity to buy into SF. Take it from someone whose been here since the 70’s and seen it all. The last time we had it this good was in the late 80’s early 90’s. I am always pleased to read that there are rich people who want to live in lofts, and barns, and sterile high rise buildings. It confirms that there is no accounting for taste, chacun à son goût. It allows those who want to live in nice houses less competition. It is similar to those who ran up the contemporary art movement until the recent bust. As long at there were fools willing to spend hundreds of thousands (or more) on the latest just discovered genius high school dropout artist, there was less competition for serious collectors of traditional fine and applied art. @tipster — actually, they did do work on the floors — I can’t tell from the pics for certain, but they look either refinished or replaced from when I was there. Based on all that I know they did, I think the Editor’s estimate is a pretty good ballpark guess for an entire budget. Not commenting at all on the asking price. That is a question only the market can answer, but it is a terrific example of a quality, high-end, loft. i can’t afford this place, but i second the post above as to why rich people would want to live in these lofts. bricks and timbers are exposed, and it looks “cold”. i can see the artsy and hippie type who always go against conventional thinking on everything, and especially if they have a lot of play-money. could the allure of luxurious loft-living be only a result of clever real estate industry marketing. Conifer – taste is subjective. You remind me of all the classical music faculty snobs in college who looked down their nose at jazz and didn’t consider it a “valid” form of music. What’s your idea of “tasteful”? A cute little white picket 2/2 in Noe Valley with a couple of kids and a golden lab? The Oriental Building is one of the few buildings left in the area that survived the 1906 quake, the demolition and removal of half of Rincon Hill for the Bay Bridge, and the Second Street “cut” which effectively killed this part of town from the rest of SF. This place is gorgeous. If I had the scratch, I’d be all over it. The Kitchen cabinet wall alone would be $65-75k (Boffi/Bulthaup/Varenna start @ $1-1.5k per linear foot) so I wouldn’t surprised if $250k was spent on this place, especially with high end fixtures and appliances. They should have tossed the oak floors or at least gone with quarter-sawn or rift-sawn. This place is much nicer than any unit in the Infinity/Brannan/ORH set. I like how socketsite just spoke in the third person using the royal “we”. Missionite says we like that about Socketsite. Well, if SocketSite is a one-man outfit, they deserve to be treated like royalty (vassals should buys Them 1507 Dolores). Pray tell there is only one true missionite. Its time for a snark-off, fowl impostor!!! how about the most recent OW sales? That wall of white kitchen cabinets reminds me of the look of a 1980s era mainframe computer room. Add some raised flooring to complete the effect. It looks cool, but makes me want to load a stack of disk platters into that wine chiller and hit the “MOUNT” button. A WHOLE GIGABYTE online at once : imagine that ! The two latest are post stock market crash and offer a baseline for comparison. I assume both don’t have nearly the same level of finish but let’s assume $250k in remodeling. Unit #222 sold for $522/sqft while unit #309 sold for $684/sqft. Unit #112 is asking $942/sqft… At $861/sqft the ask would be $1.55M; At $681/sqft the ask would be $1.225M. The 2004 purchase price was $527/sqft. After a 200K price cut, this will be 800/sq ft. Perhaps it will be featured on SS again when the extreme wishing price is replaced by something a little less fantastic. I AGREE WITH FISHCHUM completely: taste is subjective, which is what I wrote. I am happy indeed, as I said, that others have different tastes. I quite like the Oriental Warehouse, with which I have been familiar for many years. Did you know that at one time, about 20 years ago, it contained the dis-assembled interior of the old City of Paris department store? I wonder what happened to the parts that were not put back in the Neiman Marcus that replaced it. But I would not want to live there. don’t forget about OW #213, the cape horn lofts and the lofts at 300 beale. OW #213 is a also a a corner unit with a large arched window (w/no view). #213 actually has more of a view through holes/windows in the brick wall and not just at the brick wall (difference between #1xx and #2xx units), a remodeled kitchen with gas stove, prime parking spot (although not 2 spaces), a custom wood staircase, custom floors, etc. #213 was listed at $1,498k (and it even included a “plasma flat-screen television”) and sat on the market for months. it disappeared and then was relisted for $100k less and didn’t sell and has since disappeared again. similarly, 540 Delancey St #401 (Cape Horn lofts and one block away from OW) similar style, 2 outdoor spaces, remodeled kitchen, same neighborhood, etc. this was on the market for $1,150k for quite some time then disappeared. it was relisted back in january for $1,098k and has been sitting unsold ever since. then of course there are the units at 300 beale which all seem way over priced. there are three units currently for sale: #406, #609, #611 as well as the unit that was unlisted #319 that didn’t sell. neither did the owner of #319’s other 2 bedroom unit that pocket-listed for ~$1,300k but didn’t sell either (surprise surprise). now, a more reasonably priced #407 sold but that was at a roughly ~$550 sq/ft and nowhere the $800-$900+ sq/ft of these other units. a) the relative pricing difference on a sq/ft basis between OW / Cape Horn / 300 Beale? 2)why these would types of apartments would not experience the same drops as other units in SOMA? They definitely did work on the floors … even if they didn’t originally want to. My office used to be in this building and one day while driving into the garage, I noticed a ton of water flowing out that big window. A contractor goofup (nobody living there at the time) and the entire place was flooded for at easily for 2 days. Nothing that replacing the flooring can’t fix of course. guys – you’re smoking crack on those rent estimates. Whatever you think of this place, this rents for 5k. This is super high quality and it’s unique. Crappy faux lofts in sketchy neighborhoods go for 2k-3k. $5K for rent, $6K — all noise compared to the $11K/month it would cost to own at the current list price. Best loft conversion building in SF ever, hands down. Always has been. Agree with movingback, and other than the floors (which can be replaced pretty easily for not too much money) it was a spectacular remodel job. But it isn’t clear that even a remodel is paying itself back these days. Check out 2315 Divisadero unit O. They bought the place for $810K a year ago, and it looks like they sunk about $120K into a remodel: kitchen, two baths and floors. They listed the place for $939K, in what looks like an attempt just to get their money out (without worrying about the realtor fees) and it hasn’t sold for 5 months. It’s now listed for $759K. If it goes over by 5%, they still lose the entire remodeling expenses and the realtor fees. The finishes obviously don’t compare, but this is a condo in pac heights. Divisadero is a busy street for pac heights, but only one lane at that point, and it’s a safe area. 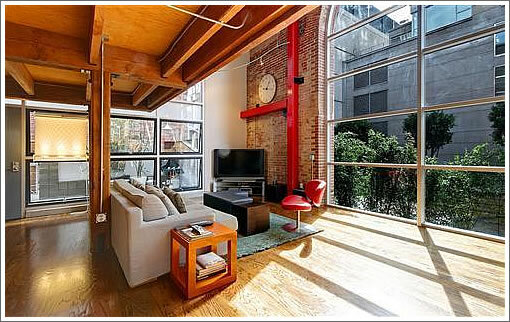 It’s certainly no more busy than the streets around this loft and certainly a better location. Purchasing at the peak didn’t help the flipper in pac heights, and the loft having been purchased much earlier, in 2004, will help, but pac heights is supposed to have held up better than this area, and yet the pac heights flipper is not going to get their costs of remodeling at all. If the pac heights listing sells at asking, they’ll have lost about 20% in a year, including realtor fees. So there is no guarantee that costs of remodeling get returned. That said, this is probably one of the nicest lofts in the city right now, and there has to be more than 1 buyer looking for something like this. MossySF — are you sure? That big window doesn’t open. one thing on this. Typically remodels DON’T increase sales prices enough to justify their cost. Typically remodels have been considered consumption, and not investment. So a person might sink $$$ into a remodel, and then only get x% of that back when they sell depending on project. according to Remodeling magazine ONLY Deck addition, MINOR kitchen remodel, and window replacement increased home values in 2007. The rest showed less cost recouped then spent. (meaning you spend more than the home goes up.). This is 2007 data and for the Pacific region of LA, SD,SF, Seattle, Portland, Sacramento… so during the bubble years. but the bubble years brought out a national mania, and then you saw people rearranging furniture and painting, and then flipping the house for 20% more. That was the anomaly over the last 100 years. and much of it wasn’t due to the remodel, it was simply due to general RE appreciation. 2) it might help you sell your home. some homes won’t sell AT ALL without a remodel. (so you could argue that it’s raising the value since it wouldn’t sell without the remodel). 3) you can do it yourself and have excellent skills. Then you increase the value of the home more than the cost, specifically because your labor is what is increasing the home’s value of the house. (I’m thinking of people like Paco and some of the contractors/developers). basically, we’re returning to normal where remodeling is consumption. which is a good thing. whoever proposed that granite countertops or 9-head showers were an investment should be shot since they’ve helped to bankrupt our country. They busted the bottom window panes to let the water drain out. doesn’t seem logical to hope that remodeling costs should be recouped fully in a resale. you have to first shell out money to destroy what was originally there (probably something nice and perfectly functional in these high end homes); so you’ve just paid money to destroy value. then you pay x amount to bring it to whatever shape fits your taste. as a buyer, i’d rather pay a lower price for the unit in the pre-remodel condition, and put in x dollars to remodel it according to my own taste. i could hire the same interior designer and contractor as the owner too. This will not only require a buyer with advanced taste but also one without a susceptibility to claustrophobia. this had to be a transfer of a single parking spot between units in the building. To Loft watcher: Unit 213 1prkg is posted on craigslist for $1.35 @ $963 sqft. unearthly figured #112, 2prkg is $942 sqft, which would you want? To unearthly: your numbers seem to assume the same sq ft size. To my recolection most units are 1300-1400 sq ft.
Mossy SF: There was no flood in this unit. You are recalling a flood in unit 213 which is located above the garage door. Thanks John. I will be listing sometime soon #416 for 990K with one parking space… However, I don’t have the upgrades that either #112 or #213 so nicely display! > There was no flood in this unit. > garage door. Thanks John. It seems that you purchased at the peak of the market. Care to share your insight into pricing given the macro environment and bursting of the real estate bubble (other than trying to recover your investment)? quimsf, thanks for sharing the inside scoop, and best of luck. I suspect your unit at 990K will sell long before the ones that are asking ~950/sq ft, but we shall see. Thanks for the wishes Steve, and I have to say that when I said that the Oriental Warehouse is not for everyone, I should add that there are a few recent buyers that purchased the Lofts and don’t even live there… they keep it for when they are “in town”… so even #112 & #213 have a fair shot of selling just because when money is not an issue the Oriental Warehouse offers a discreet safe heaven! thanks for sharing. appreciate your candor. i will be sure to come by your unit when it gets listed. do you have any additional info you can share on renting in OW (there are 3 units on CL right now) and how that market has changed recently? Loftwatcher – thanks for your comment and regarding rentals I can only say that #418 was rented via a yahoo ad for 3k and that’s a good return, why? Because that landlord is the original owner and he/she paid mid 300’s in 1997. Shopper – I have the original book that owners would get when they purchased an Oriental Warehouse Loft. It shows all units and their sq/ft. So I confirm that it’s in fact one of the larger units in the entire building. That book is a rare piece and I have never seen it available at any previous open houses. I will have it available for viewing on my open house (#416). Shopper — my appraisal on the unit actually lists the total living space at 1955. Floor plate dimensions are: Lower: approx 49 x 25 (at the widest point, 22 at the narrowest); upper floor 49 x 24, 16, and 13 (upper floor progressively narrows obviously). Hope this helps with perspectives on the actual size. and off the market as of May 6. anyone know what happened? I’ll be shocked if it actually sold. Given that my example above, 2315 Divisadero unit O in Pac Heights sold for $735, when they purchased it one year before for $810K and then completely tastefully remodeled it to the tune of $120K (total in: $930, total out: under $700 after realtor fees and transfer taxes), the owner of this place probably didn’t want to sell. Your listing is off the market as well. Did you sell? At that asking price, I doubt it! #414 is now on the market asking $1.299, a tad below the ’07 price of $1.310. I rented this unit from probably the person who sold it to JohnK as a live/work loft for my business for a year or so. IIRC we paid $6,800/mo initially. Those were crazy times! I agree with John on the work done – it’s truly stunning. Living beneath the Brannan is a bit creepy, particularly since my desk was at the foot of the stairs looking out and people on their balconies would watch me burn the midnight oil, but I’ve been in ~half a dozen OW units and it’s by far the best of those. Priced to suit! I came to socketsite trying to find if the AIA Home Tours on Sept 13th is going to look at this unit. Anyone know if the upgrades were done by Edmonds+Lee Architecture? Your listing ( # 416) is off the market as well. Did you sell? #112 Never sold. BOM, $200K less. 416 back on, dropped to 939K. #416 mentioned earlier just listed at $1.495m and sold in a few days at the asking price. Highest price ever paid for a unit at the Oriental Warehouse.